These are a couple of our early ultrasounds that have been taken. The first on was taken when they were 7 weeks, 3 days on November 14th. 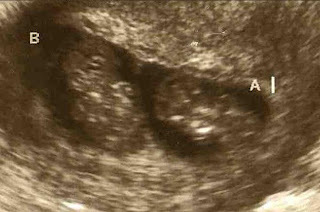 The dark crescent-shaped area above the babies is the blood clot. The second picture is from December 1st, or 9 weeks, 6 days. 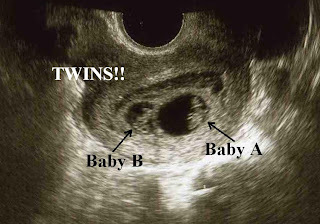 On this day, we were able to audibly hear both babies' heartbeats, both at 176 bpm. We were also able to see blood flow and see a lot of movement from both of them. They are both measuring perfect for their age, and we have decided to name Baby A Pooh, and Baby B Tigger, after their first presents they received by some friends of ours. Seriously, I am glad ya'll decided to do this. I LOVE seeing the ultrasounds. Pooh & Tigger are cute lima beans already! I have been keeping up with you thru Jennifer. I can now add you to my favorites list and check on you frequently. I am so happy for you both. Jennifer has been keeping us up-to-date on everything. I will be checking in so keep on blogging! We are so proud of you two and look forward to adding TWO more babies to our list of grandchildren. Can't wait to hold them in our arms and give them hugs and kisses. Well, let me try to stop the tears sufficiently to be able to see the keyboard!! What a wonderful, ongoing story! I am so happy for Randi and Todd! Randi is such a sweet lady - I first met her when she adopted Dante, and American and Canadian Champion Pointer who was looking for a retirement home. She and Suzy came to get him - I have an adorable photo of Dante sprawled in the back seat of Randi's car, awaiting the drive to his new home. He never looked back! He has now been joined by his new baby brother, Duke, who will pursue his championship with us when Randi and the babies come home from the hospital! Dante will stay home, as ever, in charge, to watch over his new baby boys! I feel like an expectant grandmother! What a wonderful family, Randi, Todd, Dante, Duke and the new baby boys!